Among other things this claim should contain a larger direnni ruin. Also, claimed, granted, and such. Would it possible to include some kind of fort ruin in this claim? 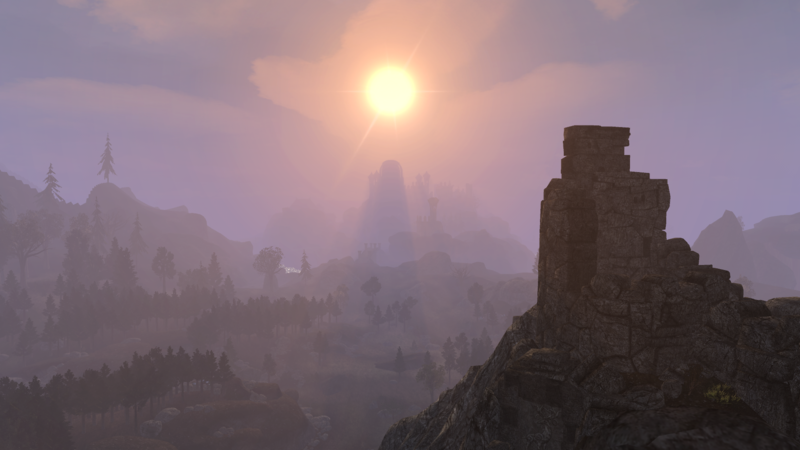 It would be the ruins of Lakvan's Stronghold from Shadowkey, which based on this map was located somewhere north of Dragonstar, on the Skryim side of the border. Lakvan was a minion of Jagar Tharn and worked with the Shadowmage Pergan Asuul. His lair would be a nice historical reference to the Imperial Simulacrum. Hi Yeti! We've had quite some discussion on Lakvan's Stronghold already, on Discord. Initially I wanted to place it in #8 or on Mesa 3. But we concluded that we'll place it in #1, in place of Cascabel Hall, which would fit better in the Western Reach after all, as it is connected to Farrun and would thematically fit better there. I think Lakvan's is a much more suitable location for us. Ah, that's a good idea. Carry on then. Just a little update here, to collect some feedback on the area. I have added some farms to the Druadach parts of the claim, as well as working on the transition and raising some terrain to complement the mountain in a few places. Should be clean, but keep in mind this includes cells from neighboring claims, rendering it incompatible with Markarth, Rest_exteriors and Sky_main. In fact, this also includes a row of cells from the northern claims #1 and #2, which were needed to fully flesh out the regional transition. I will not finish detailing these, hence they should be used as a base for the other claims by whoever will work on them. More files. About five cells to go, plus detailing around some points of interest. Definitely load this together with the file I posted in berry's thread in order to see and appreciate the whole transition. Some small nitpicks: in the file you posted the mountain cliffs are made of RES (snowy) variants; in my opinion it looks off just next to the green area of northern Druadachs/Midkarth. I'd also reduce the numbers of farmlands container plants myself, like we did with Karthwasten fields, but then, it's less of an issue here, where the performance is not a problem. I'm not sure about the stoneflowers myself, if I may ask, what's the reasoning behind using them next to HR borders - since we're removing belladonas, shouldn't we avoid using Morrowind plants moreso, a minori ad maius? Placeholders? Thanks! Eh sorry, the file is slightly outdated; I have noticed the RES usage a while back and replaced them with the regular RE ones (thus also complaining about the UV in the error thread ^^). I copied them from Lestat's Haafinheim mountain, and initially wasn't aware of the fact that there are non-snowy versions I really should be using. As for crops, I fit it to the nearby farmlands area, though I believe Worsas has since mentioned we should reduce them there too, so it's really no problem. Thanks for the heads up. I shall make these changes. Stoneflower, I got the plant list from this thread: http://www.project-tamriel.com/viewtopic.php?f=87&t=646 . What does everyone else think about it? I'm fine with removing it entirely, better now than later, since it only affects a dozen cells or so yet. Back then I figured if it's a plant that grows in rocky, less temperate areas, like West Gash, it wouldn't be absurd for the plant to embrace growth in this area. Similarly to many plants on earth found on entirely separate continents, even, with no way other than evolution to make their way to remote places. That said, I actually don't care much for the stoneflower usage. Here's a new file that doesn't have cells from northern claims in it. Note: When merging this with FF1, please connect the roads in -111, 21. There's also a tiny land tear in the same place.